Questions about coaches, mascots, jersey numbers, Super Bowl trips, of the St. Louis Rams. 1. What are the official colors of the St. Louis Rams? 2. What team did the St. Louis Rams defeat in Super Bowl XXXIV (1999-2000 season)? 3. 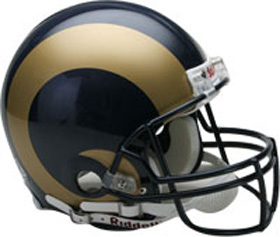 The Rams relocated in 1995 to St. Louis. From what city did they move? 4. What is the official mascot of the St. Louis Rams? 5. What was the nickname for the St. Louis Rams' record-breaking offense during the 1999, 2000, and 2001 NFL seasons? 6. St. Louis great Marshall Faulk played for the team from 1999-2006 eventually having his jersey retired with the Rams. What jersey number did he wear? 7. In what stadium did the St. Louis Rams start playing in 2001? 8. What position did NFL great Steven Jackson play for the the St. Louis Rams from 2004-2012? 9. Who did the St. Louis Rams select in the first round of the 2014 NFL draft (second overall)? 10. Who did the St. Louis Rams hire as their head coach in 2012?